This question takes me back to the day I got my college dorm assignment. For most prospective college students, this is an exciting day — the day that the experience of heading off to college finally becomes real. But things went a little differently for me. I had picked Princeton because of the academic offerings, but I can’t deny that the beauty of the place had drawn me in too. My aunt and uncle lived in the area, and I had been visiting the campus ever since I was a kid, so I’d had plenty of time to imagine myself there. And ever since I first started thinking about applying to colleges, I had been picturing myself in one of those old gothic-style dorms, the ones that feel like they’re out of a movie, with stone facades and spires, arched doorways and multi-paned windows. Then the letter arrived. I tore it open and immediately felt a sinking sense of dread. I had been assigned to Butler College, a set of modern dorms so notoriously ugly that they have since been torn down! (Yes, you read that right: the dorm I lived in made students so miserable that even though it was much younger than the leaky, drafty old gothic buildings, the university had to tear it down and rebuild it in a more pleasing style. Really!) These buildings had stark facades made of concrete and a brown brick so dark it almost looked like it had been scorched. The rooms had the same exposed dark brick on one wall, institutional windows, and minimal square footage, with only one possible configuration that could accommodate both roommates without bunk beds. But the worst part by far was the notorious “waffle ceiling,” which was as if the architects had taken a giant Belgian waffle and placed it atop each room. Not only was it mystifying, but it gave one an unsettling “Honey I Shrunk The Kids” feeling on waking up each morning. Seeing how distraught I was by this, my stepmom kindly offered to drive with me down to the school over the summer to look at the situation, reassuring me that it couldn’t possibly be that bad. We managed to get into the building, where she took one look, tried valiantly to hide her horror, and promptly suggested we get ice cream to figure out our next steps. By the time I moved in, I had cheerful, peach-colored bedding and a yellow throw blanket for my bed. I found vintage fruit crate labels at an antique shop and used them to create a pop of color on the ugly brick wall. When I got a single the next year, I brought a small green velvet sofa from home that added another pop of color. And all in all, while it wasn’t my dream dorm, it became way less awful than I’d imagined. I often hear from people with slightly different versions of this situation. At a recent event, a psychotherapist asked me what to do about a ugly waiting room that she shares with other practitioners where she rents space. Lots of renters have reached out to share their frustration at being stuck with with oatmeal-colored walls and dated kitchens. And so many of you have asked me what to do in your workplaces, especially when you work for a conservative company or one that does not believe in investing in workspace. So here are my tips for creating joy in spaces where you aren’t fully in control. Even when we don’t have full control over a space, we often still have some agency. 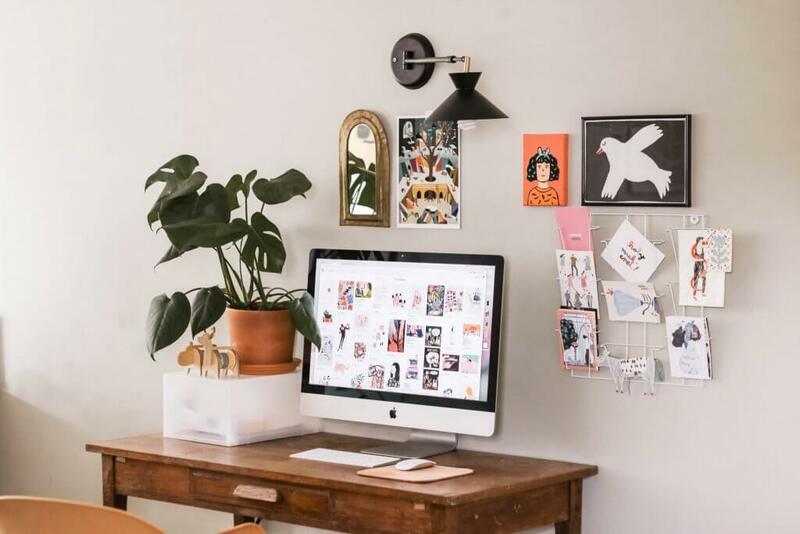 You may not be able to influence your whole office, but you can do things to make your desk more joyful, such as adding a lamp, a plant, a colorful cushion, some art, etc. Maybe you can’t paint the walls, but you can add color through a rug or removable wall mural. Maybe you can’t change your cabinets, but you can get a bright kettle or a vibrant rug for under the sink. Just like the yellow blanket and vintage fruit labels against that ugly brick, a small joyful pop helps makes all the stuff you don’t love recede into the background. This approach involves looking for things that are in obvious need of fixing, and then offering to pay for a (joyful) upgrade. If the chairs in your reception area are old and dusty, propose a colorful update. If the lighting is dull and sallow, suggest bright new fixtures. If there’s a plant that people keep forgetting to water, ask if you can take it home and it with some really well-designed fakes. Obviously, this strategy requires that you have the resources to pay for the upgrades, but if you do, this can be a great way to pave the way for future changes. I think of the story of the Tirana shopkeepers, which I talk about in the first chapter of JOYFUL. 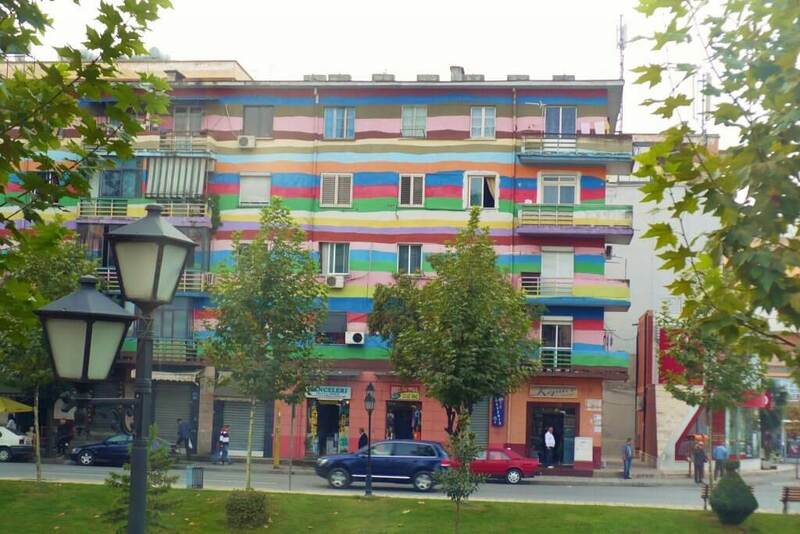 After mayor Edi Rama painted the downtown buildings in bright colors, the shopkeepers started removing the metal grates from their windows because they said the streets felt safer. 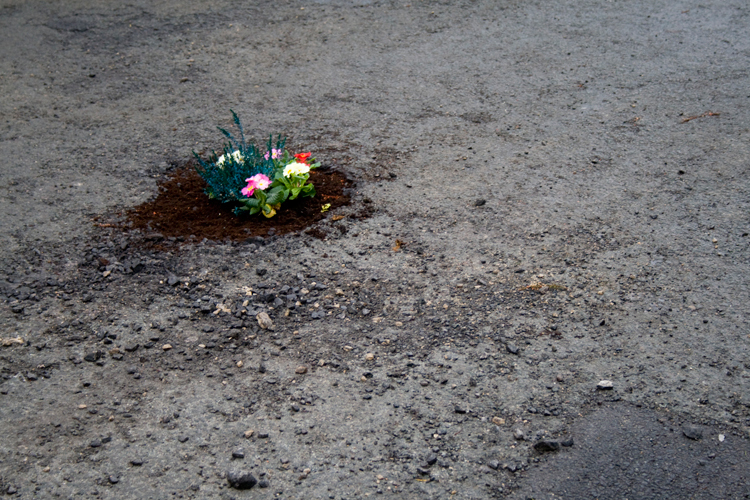 Then they banded together to pay for repairs to the sidewalk because they began to see how these small cosmetic changes influenced their businesses. Similarly, if you can make strategic changes that make a real difference in how the people in your space feel day-to-day, it increases the likelihood they’ll participate in the next wave. Let’s say you want to change a common space like that waiting room the therapist asked me about. 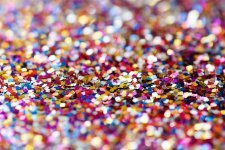 What’s one small way you can let your joy spill out into the common area a tiny bit? Could you place a rainbow rug just outside your door, brightening up the shared hallway? Could you mount a small vase on the wall next to your buzzer, and place a couple of flowers in it whenever you’re there? This strategy is a form of “going rogue,” so you want to be mindful of how you do this. The key to this strategy is to make anything small and easily removed in case anyone objects. It’s best if you can ask for permission first, but if you think that your request will be preemptively dismissed, I’m not opposed to asking forgiveness instead. 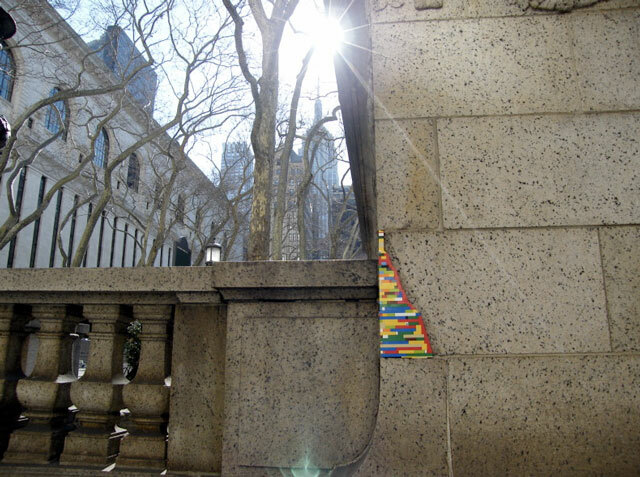 A number of guerrilla art projects can provide inspiration here, from artist Pete Dungey’s pothole gardens to the artist Jan Vormann, who fixes buildings with Legos as a way of calling attention to structures in need of repair. Sometimes, people are so happy with the results that they’ll follow suit! The hallway in my apartment building is very gray, and I’m thankful I only have to pass through it briefly on the way to my apartment. One year I got a little over-excited at a wreath-making course and came home with a truly gigantic wreath that I proudly hung on the door. Even though it was still mid-November, the holiday fever spread and suddenly all manner of garlands and bows were popping up on neighbors’ doors. It made for a very joyful holiday season! If the space you’d like to improve is a community space, you might gain more traction by involving the community. 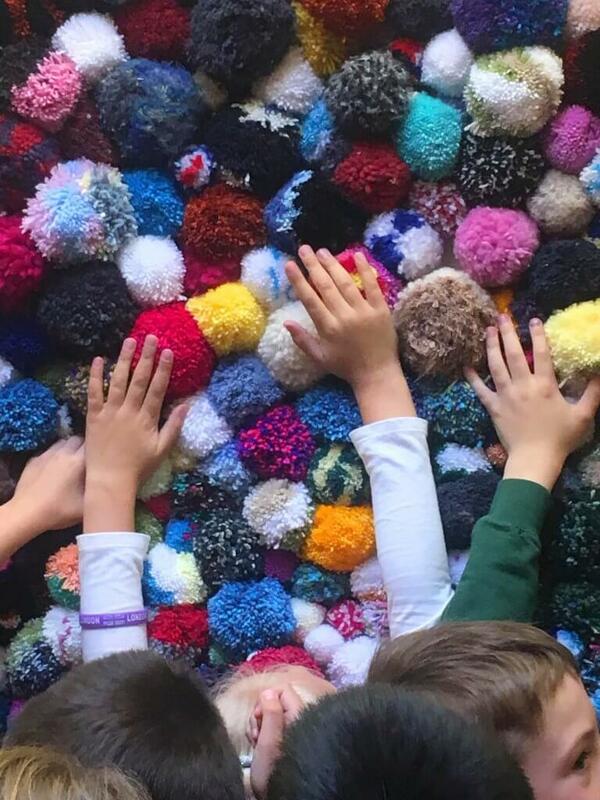 For example, I was really inspired by reader Kirsteen Stewart, who worked with a local school in Orkney, Scotland to create touchable pompom wall for the school. People from the community got involved, with requests to contribute from as far as Australia. This strategy sometimes works well in offices too. Is there an area where you and a few coworkers might propose a mural to brighten things up? Or if your company has an employee wellness budget, perhaps you could suggest an initiative that serves two purposes. For example, could you invite a plant expert in to teach your team how to care for indoor plants, and simultaneously build a living wall or a succulent garden for your office that you’ll all pitch in to care for? Taking the transformation of space from a decorating exercise and turning it into a community building often helps people see more value in it. Have you managed to bring joy to a space you don’t fully own? What worked for you? Please share your projects and tips! Images: Elsa Noblet via Unsplash; Tirana building by Colin W. via Wikimedia Commons; Pothole garden by Pete Dungey; Lego repairs by Jan Vormann; Pompom wall by Kirsteen Stewart.